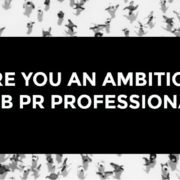 Evelina Jankauskyte has joined AMBITIOUS PR as a Senior PR Consultant with a brief to expand the agency’s Digital PR offering. Jankauskyte, who relocated from London for the role, has experience of working for award winning fast growth integrated agencies. Her experience spans consumer and business-to-business communications and she has worked with a wide range of businesses from well-known household brands through to specialist fin-tech companies and start-ups. “Evelina is an important senior strategic hire for us and her appointment comes off the back of a number of recent significant client wins. It also demonstrates our further commitment to fully integrating Digital PR into our core offering,” commented Sarah Woodhouse, Director, AMBITIOUS. Evelina will work across a portfolio of clients in the technology, creative industries, property and education sectors, delivering digital PR strategy, social media campaigns, SEO support. She will also be shaping AMBITIOUS’ in-house training offering which will include 121 coaching, workshops and seminars covering a range of digital and social media topics including Social Media Strategy, Link Building for Business, Email Marketing and SEO Corporate Copywriting. Having built a successful network in London, Evelina will be immersing herself in regional ‘place making’ marketing activity led by AMBITIOUS including Social Media Week Bristol in February 2018 and the imminent launch of the South West chapter of the Business Marketing Club.